For marketers looking to show their financial worth, ROI is then contingent upon Return on Information. In other words, showing real ROI hinges on gathering only the right information, from the right sources, to make the right business decisions. You have great content. You work hard to create useful, valuable content. Your leads consistently return and reconvert on multiple landing pages, yet you still only have their names and emails in the database. Here's how you can fix that. It's useful to view inbound marketing websites as a 24/7 salespersonfor a company. Lately though, it seems many of these virtual 24/7 salespeople seem to have become very polysyllabic. Words like enhancement, nurturing, automation, collaboration, synergy, and integration seem to permeate many business sites. Having more syllables on your website doesn't necessarily guarantee more leads. 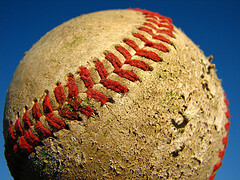 Spring is in the air, and so are baseballs - make it an exciting inbound marketing week fellow inbounders!